No one can examine this record and escape the conclusion that in the great outline of its principles the Declaration was the result of the religious teachings of the preceding period… They are found in the texts, the sermons, and the writings of the early colonial clergy who were earnestly undertaking to instruct their congregations in the great mystery of how to live…Placing every man on a plane where he acknowledged no superiors, where no one possessed any right to rule over him, he must inevitably choose his own rulers through a system of self-government. Our Bicentennial is the happy birthday of all fifty States, a commonwealth, and self-governing territories. It is not just a celebration for the original Thirteen Colonies…The earliest English settlers carried the Bible and Blackstone’s Commentary…[and] American families in prairie schooners like these took with them on the overland trails the principles of equality and the God-given rights of the Declaration of Independence. Read the Declaration of Independence. It is both a pleasurable and a rewarding experience that should be enjoyed by every citizen. 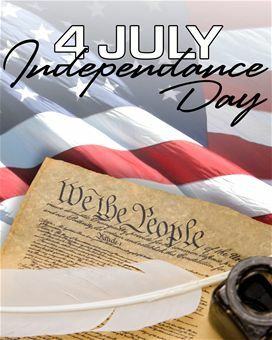 The Declaration is a deep, rich document, giving the twenty-seven reasons that America was birthed, and also setting forth in its first 155 words the six immutable principles of American government – the six principles on which the Founders later erected the Constitution of the United States – the six principles that still produce American Exceptionalism today. Learn something new about those who wrote the Declaration. Look at the names of the fifty-six signers; find one you don’t know – perhaps one you’ve never heard of before, and look him up and read a short bio about him (perhaps from sites such as Colonial Hall) or get a copy of Lives of the Signers, so that you can have a short bio about each one of the signers. In short, rediscover a new Founder. Happy Birthday America! May God continue to shed His grace on Thee!